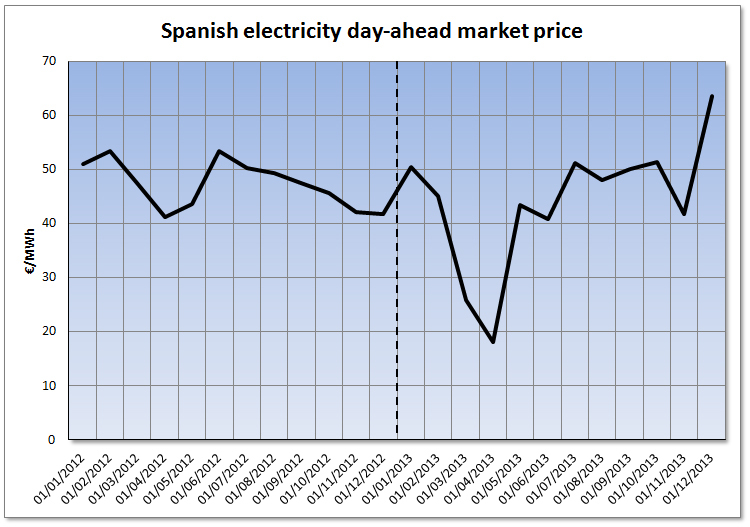 January 21st, 2014 – The price in the wholesale electricity market MIBEL in Spain has remarkably changed on two occasions within the year 2013. In March and April, prices descended in an exceptional manner because of the high hydroelectric and wind production, caused by favourable weather conditions. In particular, the second historical lowest value of the monthly average of the day-ahead market price (18.17 €/MWh) was reached. On the other hand, in December, the low wind production and the unavailability of nuclear power determined an important growth of the monthly average price until the value of 63.64 €/MWh. 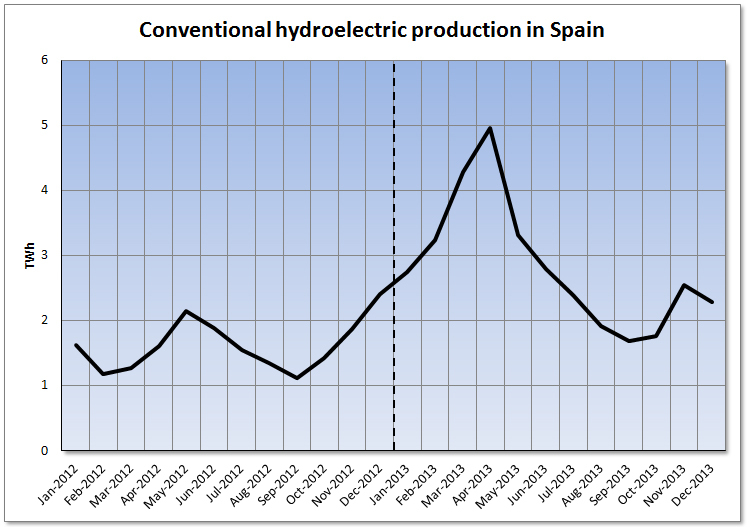 In 2013 the electricity consumption in Spain lowered by 2.2% compared with the previous year. 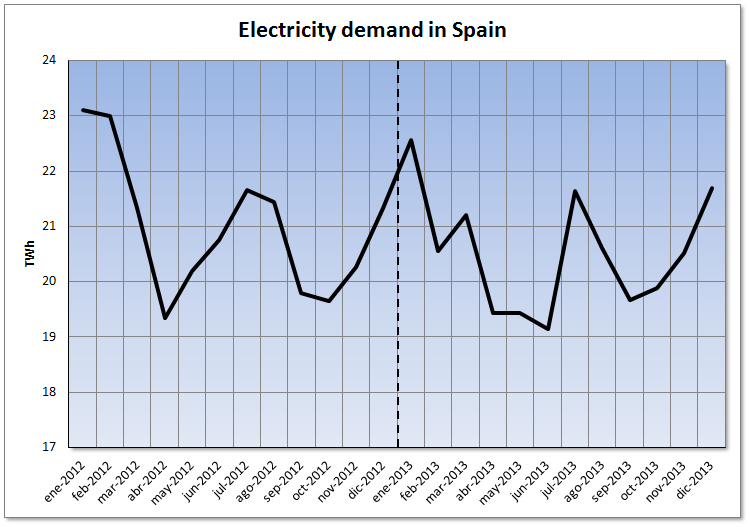 The electricity demand in Spain has diminished in the first three quarters of the year compared with the same quarters of 2012. In the last quarter, instead, a year-on-year growth of 1.4% has been registered. The annual average demand in 2013 has been 2.2% lower than in the previous year. Data published by the system operator (REE) indicate that, once adjusted by working days and temperature, the most important year-on-year fall in 2013 occurred in February (5.6%), but in December the electricity demand was 1.5% higher than the previous December. 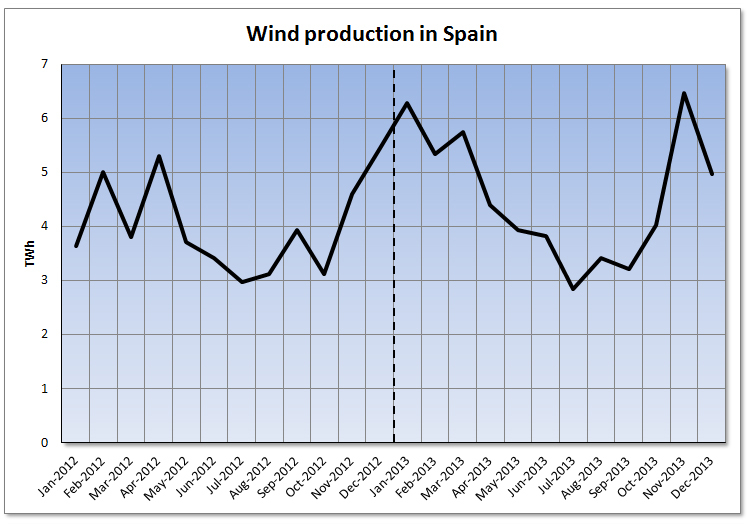 The wind production has grown by 13.2% in 2013 compared with the previous year while the installed power grew only by 0.8%, following data published by REE. 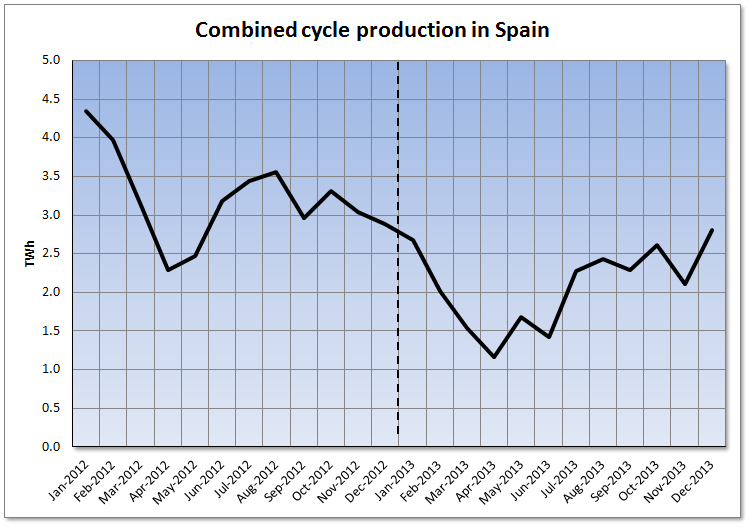 In January there was an increase of 72.6% of the production compared with January 2012. This technology registered in the first half of 2013 a year-on-year growth in production of 18.6% while in the second half of the year was of 7.4%. 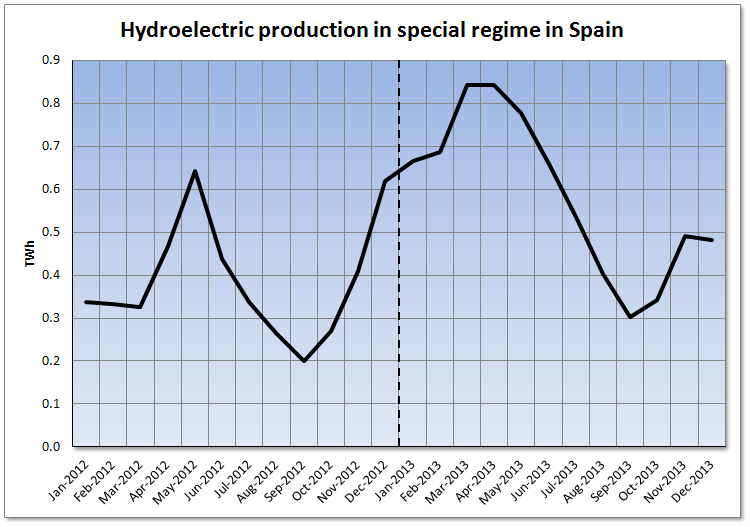 The annual increase of the hydroelectric production in 2013 has been of 74.5%. This increase occurred mainly in the first half of the year with a year-on-year growth of 119.5%, while in the second half of 2013 the year-on-year variation was lower (29.5%). April was the month with the largest hydroelectric production with 4,964 GWh. 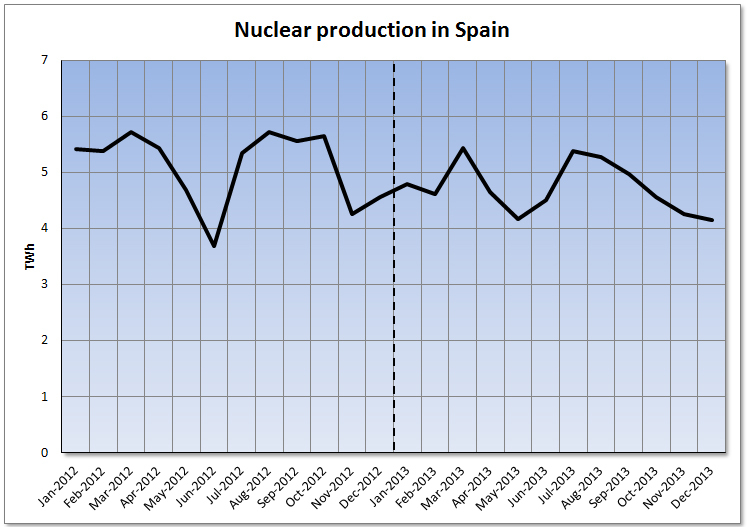 In the case of the nuclear production, an annual decrease of 7.6% has been registered. In all quarters negative year-on-year variations have been registered. The variations of the first and the last quarter (10.1% and 10.4% respectively) are more important than the ones of the second and third quarter (3.4% and 6.1% respectively). 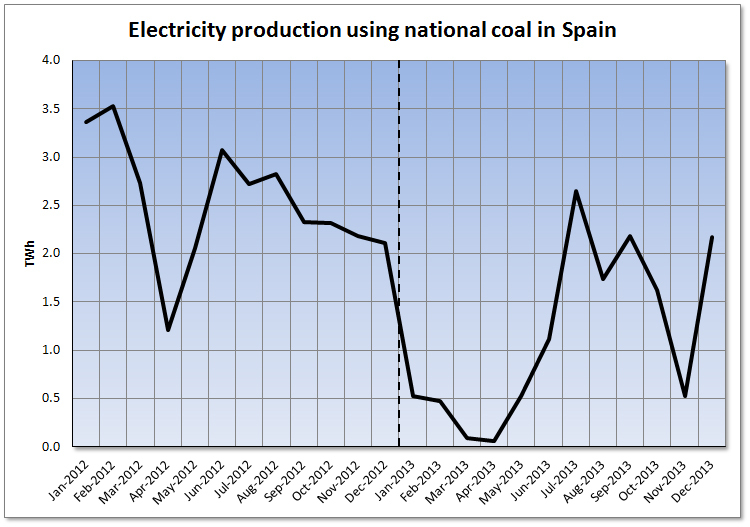 The electricity production using national coal in 2013 has been 55.1% lower than in 2012. The months with a larger year-on-year fall have been March and April with 96.8% and 95% respectively. 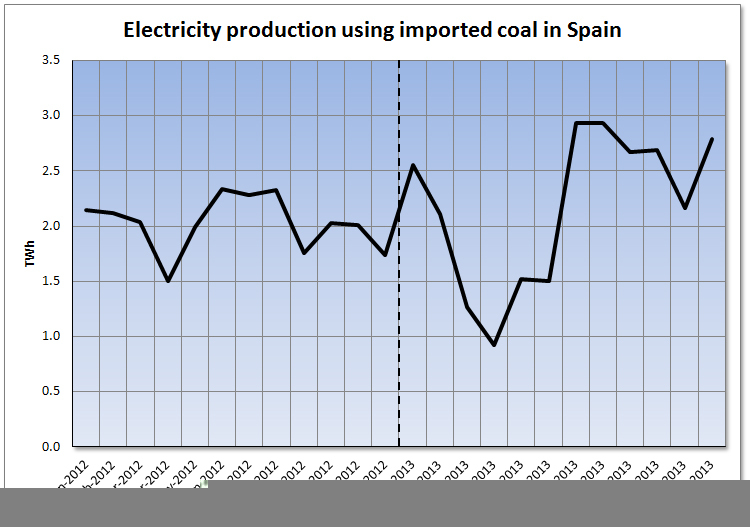 The production of electricity using imported coal in 2013 was 7.4% higher than in the previous year. However, there was a clear year-on-year decrease of this technology production in the first half of the year (18.5%) and a significant increase in the second one (33.3%). The combined cycle production was 35.1% lower in 2013 compared with 2012. In all months a year-on-year decay of this technology production was registered, being the largest one of 55.3% in June and the smallest one of 2.6% in December. 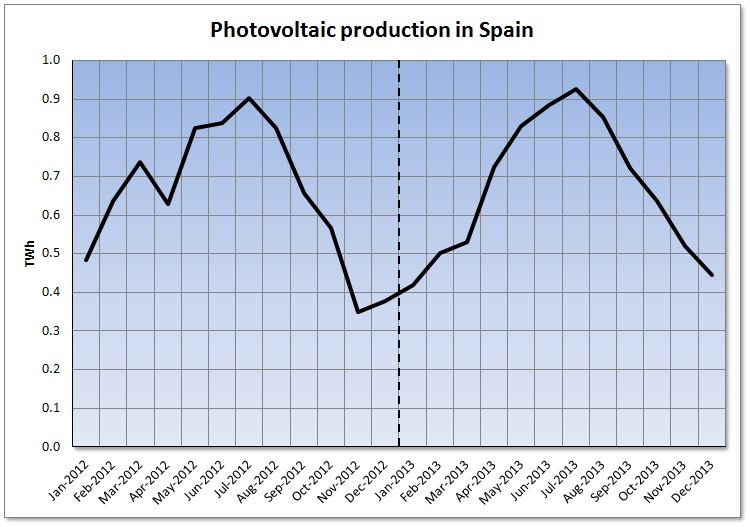 In the case of the photovoltaic production, the annual increase was of 2.1%. In the first half of the year, a year-on-year fall of 6.3% was registered while in the second half of 2013 the production was 11.6% larger than the same period of the previous year. 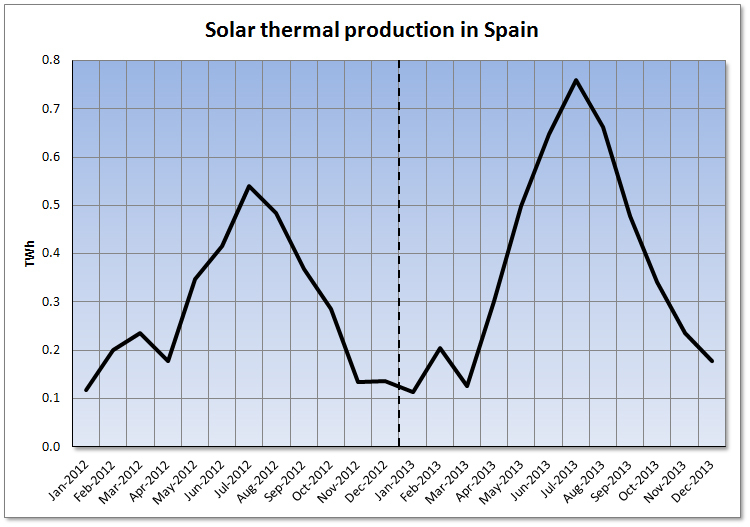 The solar thermal production had an annual growth of 31.9% in 2013. The first quarter of the year registered a negative year-on-year variation of 19.9%, but the following three quarters were characterised by significant increases in comparison to the same quarters of 2012 (such increases were of 53.8%, 36.2% and 35.6% for the second, third and last quarters respectively). 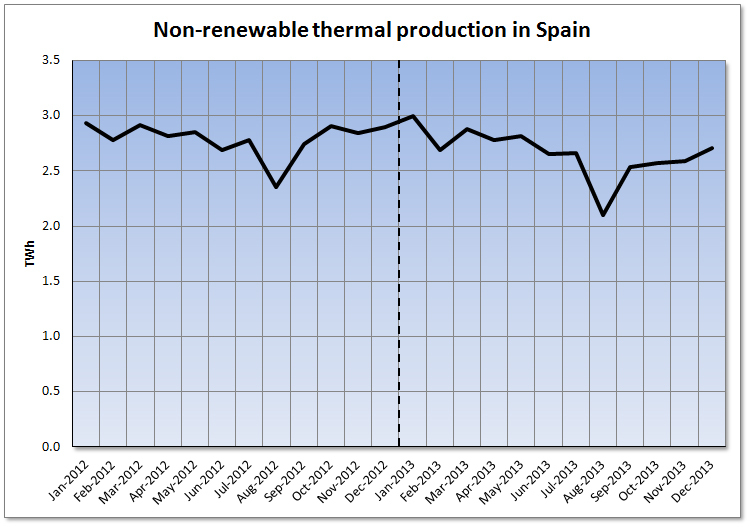 The non-renewable thermal production descended during 2013 a 4.5% compared with the previous year. In the first two quarters a production similar to the one of the same quarters of 2012 was registered, with year-on-year variations of -0.6% and -1.2% (first and second quarter respectively). On the other hand, the two last quarters registered year-on-year falls of 7.4% for the third quarter and of 9.1% for the last quarter. 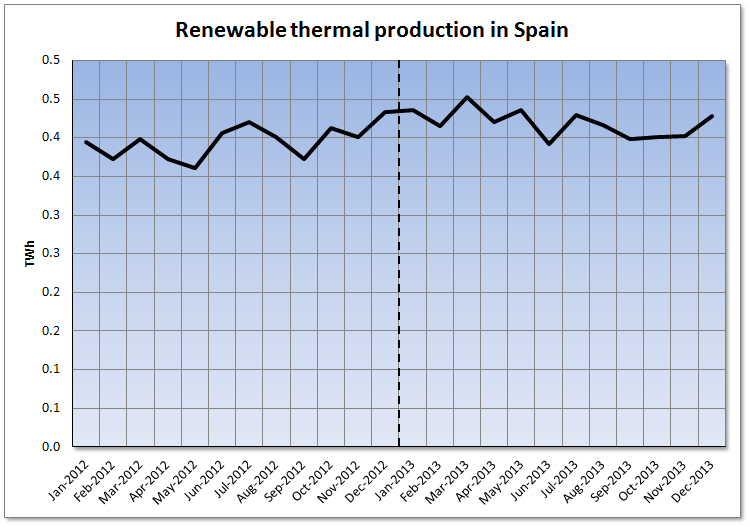 The renewable thermal production increased by 11.9% in the first quarter of 2013 on a year-on-year basis. In the second and third quarter this production was, respectively, 9.6% and 4.1% higher than the same quarters of 2012. A slight year-on-year decrease of 1.4% was registered in the last quarter. The annual growth comparing with the production in 2012 was of 5.9%. The low temperatures in Europe during March 2013 have been the main cause for the increase of theZeebrugge gas price in this month. 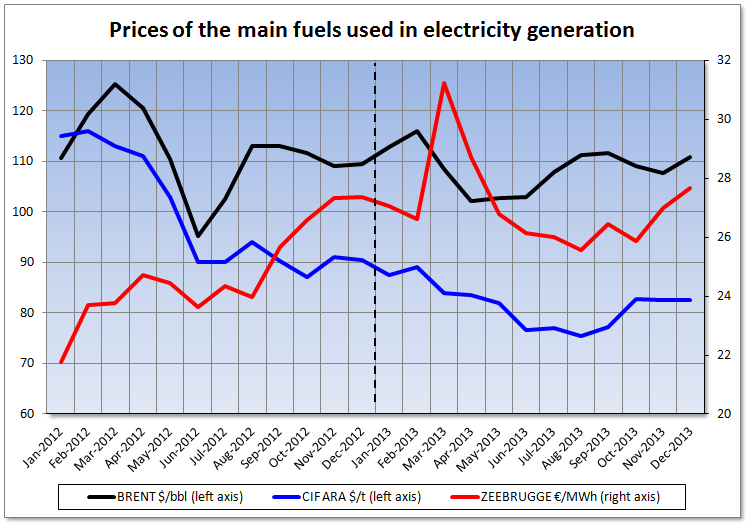 Namely, the average price of this gas in March was 31.24 €/MWh, 7.49 €/MWh more than in March 2012. The average price over the whole year 2013 was 27.10 €/MWh, 2.32 €/MWh higher than the previous year. The average price of the Brent oil barrel has been $108.57 in 2013, $3.16 less than the average in 2012. The decrease occurred mainly in the first and second quarters, with year-on-year falls of 5.95 $/barrel and 6.14 $/barrel respectively. On the other side, in the third quarter a slight year-on-year increase of 0.50 $/barrel was registered while in the last quarter the year-on-year variation was negative and took the value of -0.87 $/barrel. The price of the CIF ARA European coal has been lowering during most part of 2013, until it became stable in the last quarter of the year with an average value of 82.65$/t. The average price of this fuel in 2013 has been 81.65 $/t, 17.55 $/t less than the average of the previous year. 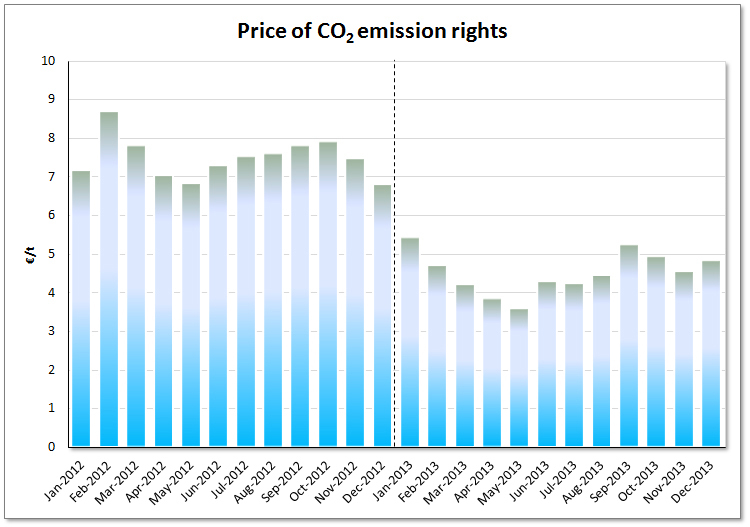 The price of C02 emission rights dropped in the first half of 2013, taking a minimum monthly average price of 3.58 €/t in May. In the second half of the year, the trend has been reversed until a monthly average price of 4.84 €/t in December. The annual average price in 2013 was 4.53 €/t, 2.96 €/t less than in 2012. 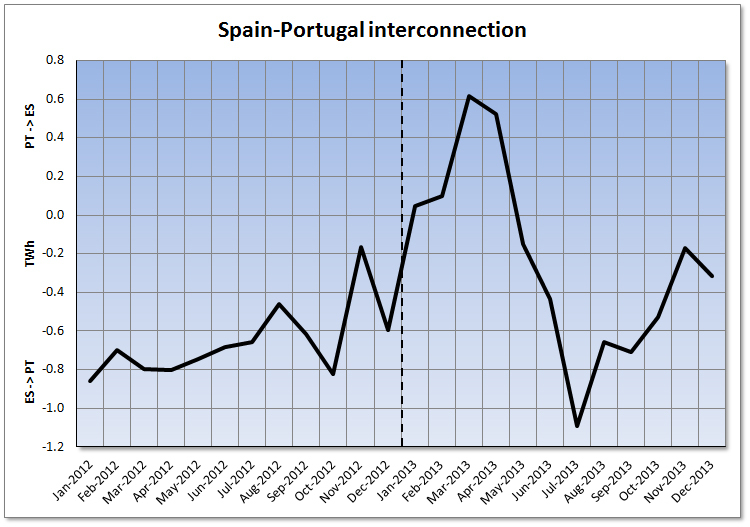 In the first four months of 2013, the monthly net balance electricity exchange between Spain and Portugal established Spain as a net importer. Spain was exporter during all 2012 from the point of view of the monthly net balances. Between May and December 2013 the exchange balance established Spain as a net exporter, registering in July a net value of 1,092 GWh exported to Portugal. The average price of the Spanish MIBEL day-ahead market took in March and April 2013 average values exceptionally low (25.92 €/MWh and 18.17 €/MWh, respectively) because of the increase of the hydroelectric and wind production, together with the demand fall during the Easter holidays. 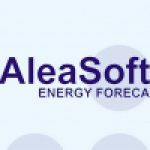 In addition, in two occasions, March 29th and April 1st, the price was 0 €/MWh for the 24 hours of the day. This fact has no precedents in the history of this market. On the other side, in December, the unavailability of nuclear plants and the low wind production –due to weather conditions- determined an increase of the price until a monthly average of 63.64 €/MWh, 21.91 €/MWh higher than in December 2012. The annual average price in 2013 was 44.26 €/MWh, meaning a fall of 2.98 €/MWh compared with the previous year. The year-on-year variation of the price was negative in the first two quarters, virtually null in the third quarter and positive in the last quarter.